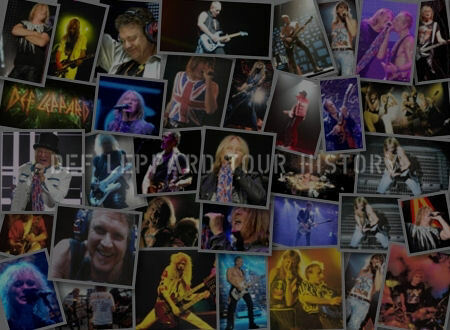 Def Leppard started recording The Def Leppard EP in Willerby, Hull, England 40 years ago on this day in 1978. The band travelled to Fairview Studios in Hull, England to spend two days recording their very first vinyl release. Day one of their first professional recording session took place on 25th November 1978 with guest drummer Frank Noon and were completed the next day. 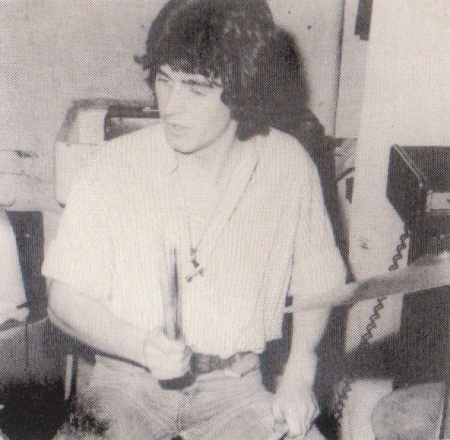 The idea for the EP was inspired by The Next Band featuring Frank Noon, Rocky Newton and John Lockton who recorded their own at the same studio in September 1978. 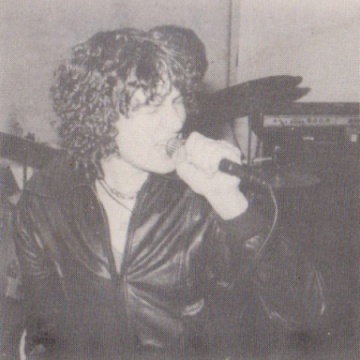 Rocky later supported Lep in 1981 as part of Lionheart and sang backing vocals on the 'Pyromania' album. 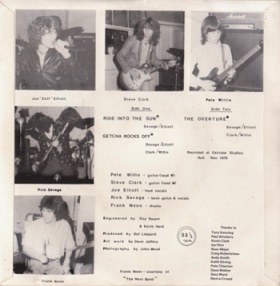 The EP comprised three tracks - 'Ride Into The Sun', 'Getcha Rocks Off' and 'The Overture'. The backing track for the most popular song from the EP, 'Getcha Rocks Off', was recorded live in only one take along with 'The Overture'. It was first released in January 1979 on their own jokingly titled "Bludgeon Riffola Records" with a red label. An initial pressing of 1,000 copies (500 of which had a lyric sheet). Reissued with a Yellow label in May 1979 by MSB Management. A limited edition white label version was also put out in 1989 by the then official fan club. View the studio as it is today at the Fairview Studios website. "I remember the engineer saying 'Now you mustn't be embarrassed to scream.' I said 'I'm not, I'm real good at screaming.' And I let one loose - 'WAAAAAAAH!' It was perfect." By 3pm, Joe was finished singing. Five hours later, the EP was mixed. It cost exactly £148.50. "We listened to it in the car all the way back to Sheffield," Joe says fondly. "We were driving over a bridge and I said 'Ah, there's a wrong note there' But it was a real good record. It really represented what we were. And somebody was watching over us when we made it. Apart from the four takes to get Ride Into The Sun, everything went perfectly. We never went out of tune. Steve was even using a borrowed guitar. He didn't want to use his Ibanez Les Paul copy. He got a Gibson from John Lockton of the Next Band." "And here we were, in these two little cars, drums piled up in the back of one, guitars in the other, listening to our first record." Getting it onto vinyl and into record stores, they realised, would take more than £148.50. Joe covered the session costs by borrowing the money from from his parents. But it would take another £450 to press up a thousand copies. Picture sleeves would be another £65. Joe raised the pressing money from a woman at Osborn-Mushet, Janie Taylor, who charged a ludicrous twenty-five percent interest on the loan. An amateur artist in the Osborn-Mushet development office, Dave Jeffrey, designed the sleeve, which was a clever ripoff of the HMV dog-and-Victrola logo. Jeffrey simply substituted a growling leopard for the dog and added discrete little dollar signs to the border design. That turned out to be wishful thinking. 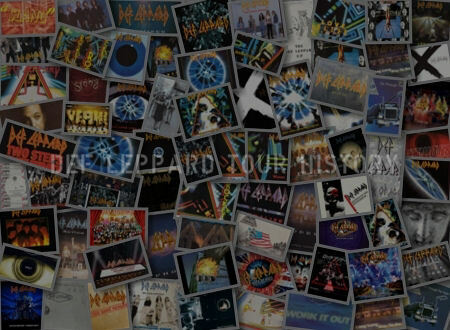 The pressing costs, Janie Taylor's twenty-five percent interest and the fact that about a hundred copies were given free to Rent-A-Crowd and mailed to press and radio - using a lot of Next Band contacts - meant that Def Leppard's profit from the first pressing of The Def Leppard EP amounted to only 60 pounds. It was a nice production for the price, though. The first couple of hundred copies even included a lyric sheet with autographed (but not terribly flattering) ink sketches of the four band members. 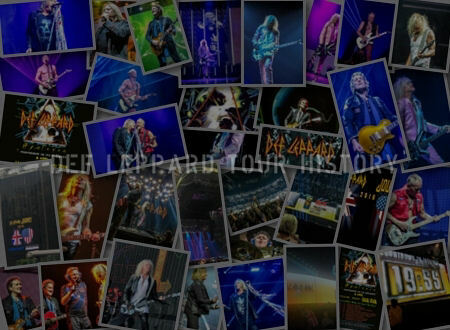 In the meantime, Def Leppard still had a drum chair to fill. 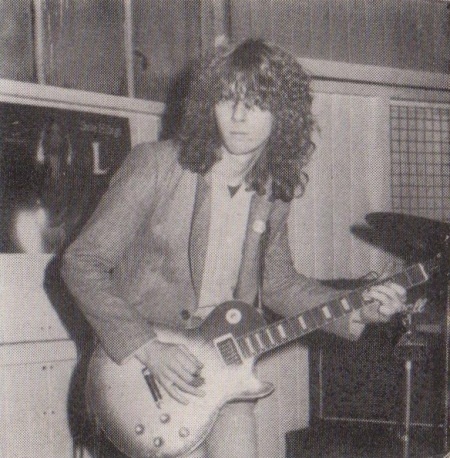 Some time during the week between Tony Kenning's dismissal and the recording of the EP, Joe asked Frank Noon if he would consider joining Def Leppard permanently. Noon declined, remaining faithful to the Next Band. "Recorded in 1978. 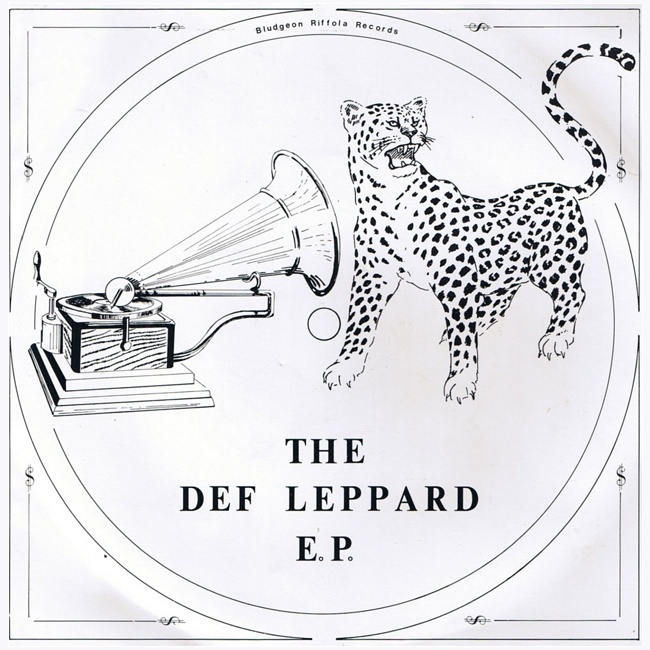 Released in 1979 that from The Def Leppard EP is a song called Ride Into The Sun. Recorded at Fairview Studios in Hull. A studio we were very to work in knowing that Mick Ronson from The Spiders From Mars had worked there." "Rick Allen joined the band the day after we recorded that EP. Which hints at the fact that he didn't play on it. Who did play on it?. One Mr. Frank Noon who came to visit us when we played Nottingham earlier this week. I've got a great picture of Rick and Frank together. frank Noon also played on this record. In fact it was Frank that suggested we went to Fairview Studios in the first place. This is the band that we borrowed him from. This is The Next Band." "And before that we heard from The Next Band EP featuring the great Frank Noon on drums who we borrowed for our EP because we were - between drummers, with a song called Never On A Win." "Right, Grantham's best. Yes, I'm not kidding. Not Maggie Thatcher. This is The Next Band." "And before that we heard a band from Grantham called The Next Band. Who once went to a studio in Hull, called Fairview Studios, to cut an EP. Hang on does that sound familiar?. Hmm we even borrowed their drummer. That's where we got the idea from. Frank Noon, we borrowed from The Next Band to perform on The Def Leppard EP way back in 1978. And from The Next Band EP we just heard there Never On A Win." 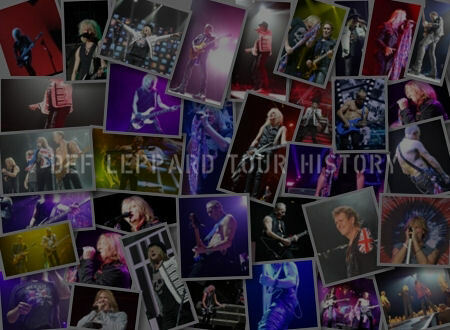 "A long time before Def Leppard had any major success we were given a lot of credit for breaking a little bit of new ground for recording a three track seven inch vinyl single and sending it out to record companies instead of sending the standard cassette tape which most bands did and they always got used as door stops or paper weights. And we thought well how can we avoid that well if we send an EP with a picture sleeve and everything it may just attract a little bit of attention." "The fact of the matter is it wasn't our idea at all we completely nicked the idea off a bunch of friends of ours that were living in Sheffield at the time. 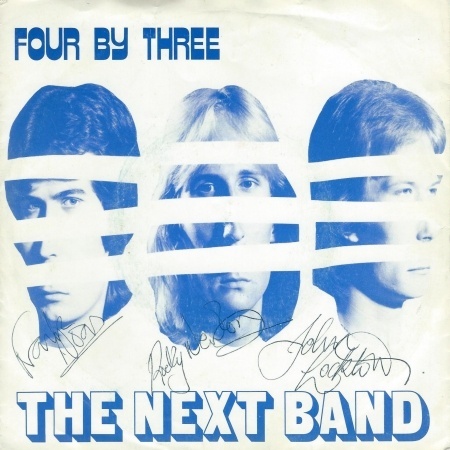 A band that had moved up to Sheffield from Grantham called The Next Band. They'd made their own EP a few months earlier and I picked the brains of their drummer, a guy called Frank Noon, how did you do it?. And he pointed us in all the right directions a little studio in Hull that used to be frequented quite a lot by Mick Ronson called Fairview Studios is where they recorded theirs so off we went with a 150 quid of my Dad's money and we did the whole thing for 148 pounds and 50 p. But going back the The Next Band. This is a track from their EP. It only ever came out on vinyl so please do excuse the crackles. This is a song called Never On A Win." The Def Leppard EP/Borrowed money from your Dad? "Yeah that's true. Took every penny out of his bank account to record a three track EP. But you know I promised him I'd pay him back. And you know a man of my word, I did in a few weeks which was great. But yeah he literally emptied his life savings for us to do that which is a hell of a commitment for a Father to give to a kid when it's like this is such an industry where people say why don't you get a real job. My parents were kind of musically, they weren't connected. But they were very musical. My Dad was a great harmonica player. Decent pianist. My Mum played guitar. And I think I was like, they were living through me, if you like, their kind of aspirations of wishing that they could have done it. So they were never gonna deny me the opportunity." "Yeah I had to finish school and all that stuff. We all did except for Rick Allen who was fifteen so he never made it through school. But we were so young and I think that we had that youth on our side which really helped. And you know especially my parents weren't gonna put a blocker on it. They said no, if you give it a go pay me back but here you are. And that EP got picked up by the likes of Mr. John Peel. The legendary DJ, in England anyway. He played it. That got heard by the A&R men at record companies who always listened to John Peel. And it started creating an interest and it was just the acorn. It was literally the seed and then people started coming to attend the shows and A&R men started coming and there was this like battle of you know ten labels to sign the band, and it was all down to that EP."